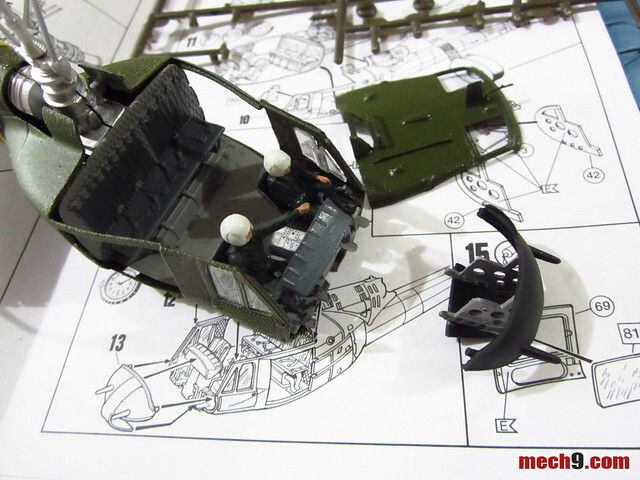 Been working on the 1/48 Huey these past couple of days and I have to say that it has been a chore to build because of the bad design of the kit. In fairness to Revell, they only bought the molds from Monogram so all the blame for the bad design should fall on Monogram and in fairness to Monogram designed kits, not all their kits were as badly designed as this one. The particular problem that has got me so revved up is the way the fuselage comes together. If you notice in the picture above, you glue the two halves of the fuselage, then the roof and the front of the nose. Not included in the picture is the windshield. Because of the design you end up with grappling the thing together and in the end you still end up with gaps between those 4 parts. The manual points out that you should putty up the gaps....blehhhh. In my opinion, the logical way to have put it together would have been to just slice the entire fuselage in the middle so the modeler will have to worry about only two parts when joining the kit together. With that design, you could have also easily eliminated the gaps by either taping or binding the two halves together with rubber bands after applying glue, that is something that I couldn't do on this kit.